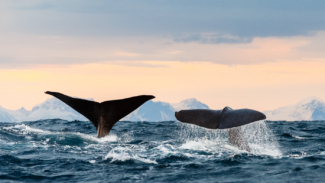 With its stunning fjords and its gateway to the Arctic, Norway offers unique whale watching opportunities for visitors year round, with opportunities to see sperm whales, killer whales and humpback whales as well as other species. Sperm whales can be observed throughout the whole year in the “Bleik-canyon” outside Andenes, where it is also possible to observe humpback whales, minke whales, killer whales, pilot whales, white-beaked dolphins and harbor porpoises year around. However, the peak tourist season is the summer. 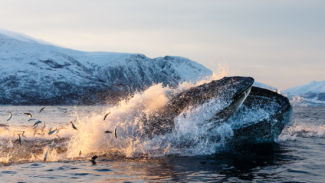 In the Norwegian spring, other locations along the northern Norwegian coast can also host large numbers of humpback and killer whales, and sometimes fin whales as they follow spawning herring that are believed to overwinter in Norway’s fjords from November to January. The fjords outside Tromsø became a whale and dolphin hot spot during the herring seasons in 2012-2013 to 2016-2017, while the fjords around Skjervøy (further north) were visited by a large number of killer and humpback whales during the 2017-18 herring season. Between May and September, blue whales, fin whales, humpback whales, minke whales, and belugas can be observed around Svalbard with day trips originating from the port of Longyearbyen. Additionally, high arctic species such as narwhals, belugas and bowhead whales might be observed on longer expeditions from Longyearbyen (lasting 7-10 days). 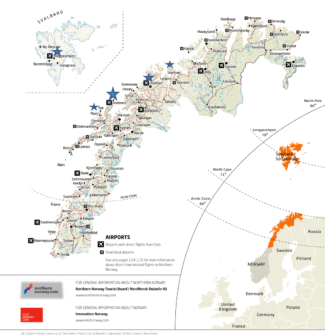 Map depicting the most important harbours in Norway for whale watching. These include: Andenes, Stø, Tromsø (herring 2012-2016) , Skjervøy (herring 2017-2018), and Longyearbyen (Svalbard). Tromsø, it also an important harbour for tours going northwards to see whales in hot spots like Skjervøy (2017-2018). Map developed by the Northern Norway Tourist Board and reproduced with their permission. -Commercial whale watching operators are encouraged to include educational programs in their tours, highlighting the fragility of the marine environment and inspiring respect and environmental friendly attitudes and behaviours. -Operators are encouraged to use boats to capacity, as well as the larger of their boats when possible to reduce the overall number of boats observing whales. -A maximum of 3 boats are advised to simultaneously observe each situation, for the sake of whales and also to enhance the “wilderness experience”. -Boats are encouraged to cooperate so that if there are too many boats with one (group of) whale(s), the maximum boat time per encounter is 30 minutes. Boats waiting for their turn should remain more than 500m away from whales where possible, or at an appropriately remote distance from the situation depending on the local topography. -Approach whales slowly, at less than 5 knots when within 300m, and at constant speed, from the side and slightly to the rear. -Move parallel to the direction of moving whales, not directly from behind where whales may feel chased, neither head-on, nor intercepting the path. Approach whales slowly, at less than 5 knots when within 300m, and at constant speed, from the side and slightly to the rear. -Move parallel to the direction of moving whales, not directly from behind where whales may feel chased, neither head-on, nor intercepting the path. Note that operators in Tromsø discourage in-water encounters with whales of any species, while this is still permitted in some locations in Norway. Approach diagram presented in the Norwhale national whale watching guidelines. Long-finned pilot whales in Norway. Photo courtesy of Camilla Ilmoni. Cosentino, A. M. Effects of Whale-Watching Vessels on Adult Male Sperm Whales Off Andenes, Norway. Tourism in Marine Environments 11, 215-227, doi:10.3727/154427316X14580612748560 (2016). 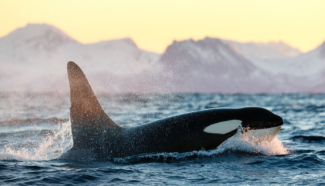 Pagel, C. D., Scheer, M. & Lück, M. Swim encounters with killer whales (Orcinus orca) off Northern Norway: interactive behaviours directed towards human divers and snorkellers obtained from opportunistic underwater video recordings. Journal of Ecotourism 16, 190-200, doi:10.1080/14724049.2016.1273939 (2017).